Field service changes as technology changes. Paper-based, on-site systems have given way to field service management software and cloud-linked solutions. Many factors will continue to reshape business models and customer experience touchpoints within field service and manufacturing, helping firms generate greater revenue and improve the overall customer experience. One primary example is drones or other unmanned systems such as self-driving cars. In 2014, The New York Times noted the likely rise of drones in manufacturing and field service work with multiple industry leaders endorsing drone technology in field service due to towers, huge industrial complexes, and other hard-to-survey areas. Drones can complete this work with a high level of detail in a shorter amount of time. High-resolution cameras can record video and quickly snap photos to capture quality imagery of infrastructure issues, like cracked pipes or machines. This is true of many enterprise-level clients, where factories and buildings can populate a vast stretch of land. Surveying the property on foot is almost completely impossible. Cars are more suitable for the task, but visibility is, then, restricted to a set height. A much more extensive area can be canvassed with a drone. Access to hard-to-reach or dangerous areas: Technicians assigned to inspect power grids/lines or oil and gas pipelines, which tend to be more dangerous field work, could send a drone to pinpoint specific problem areas or need. Data mining and increased first-time fix rate: If an FSO sends a drone to investigate a cracked wind turbine, and then funnels that data back to the scheduled technician, first-time fix rate will increase. The technician will be able to see exactly what the problem is in high-resolution detail, and when he or she visits the site, the truck will roll with all the necessary equipment. Increased cost savings: Previously for this type of survey work, an FSO might rent a helicopter. That can be extremely expensive. Commercial drones are much cheaper (as of now) and can increase cost savings while reducing safety issues. Drones and unmanned systems are just one way that field service operations are constantly being shaped by technology. To learn about some other technological applications in field service, such as machine learning and the cloud, download our eBook now. Now consider this: in many parts of the industrialized world, the population is aging -- and the departure of highly skilled workers is a real concern. Conventional economic logic today tends to indicate that manufacturing jobs do not exist, or are being automated rapidly. In reality, jobs do exist, but manufacturers often cannot find qualified candidates with the skills to fill them. 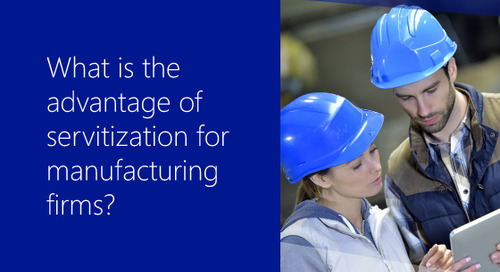 Deloitte’s research with The Manufacturing Institute shows a need for 3.5M manufacturing jobs by 2025. Based on skills gap issues, 2M of these jobs will likely go unfilled. Additionally, many manufacturing companies are now being forced to recruit abroad, which is shifting the dynamics of their local economies. The easiest way to conceptualize the power of AR in field service is to think about these issues. Younger technicians can more quickly develop skills via augmented reality in the field and in training. A technician can simulate the exact work that needs to be done to make sure he or she is doing it correctly. On certain client calls, a younger technician could go on-site and be guided by a more experienced technician working from a different location. The possibilities for closing manufacturing skills gaps are immense, and can be scaled quickly. Augmented reality, and its implications on training and development of a younger workforce, is just one way that field service is constantly being reshaped by new technologies. To learn about other applications, including drones, cloud computing, and machine learning, download our eBook now. 2. Better customer relationships: Ecolab exemplifies one way that a traditional manufacturer can embrace the value of the cloud. The company needed to work with over 36,000 water systems globally and get data to both (a) improve production processes and (b) show potential customers what was working, what was not, and what would constitute a sound business decision. Ecolab utilized the cloud, combined with an Internet of Things suite, to control processes remotely and deliver actionable intelligence to those in the field. Millions of connected data points allowed for the establishment of operational benchmarks and increased customer relationships. 3. Revenue insights: Rolls-Royce wanted to improve aircraft performance, safety, and maintenance for its jet engines. It used an intelligent cloud and machine learning (in the form of Cortana) for three key outcomes: more efficient flight and maintenance plans, targeted and actionable fuel efficiency insights, and quickly generated reports and dashboards that tell compelling stories and deliver high-quality insights. This allowed for the creation of new revenue streams. 4. More effective data-driven decision-making: Sandvik Coromant, a manufacturer of cutting tools and services for the metal-cutting industry, sought to take its service-side business to the next level, so the company developed a solution that connects to the Azure IoT cloud to collect data in real-time. The data analyzed from the machining process -- such as temperature, load, and vibration -- influenced the senior decision-making of the organization and overall next strategic steps. This would not have been possible in a manual system. The cloud is a primary example of how technology is driving the future of field service. For other examples, including machine learning, augmented reality, and unmanned systems (drones), download our eBook 5 Steps to Successful Servitization.